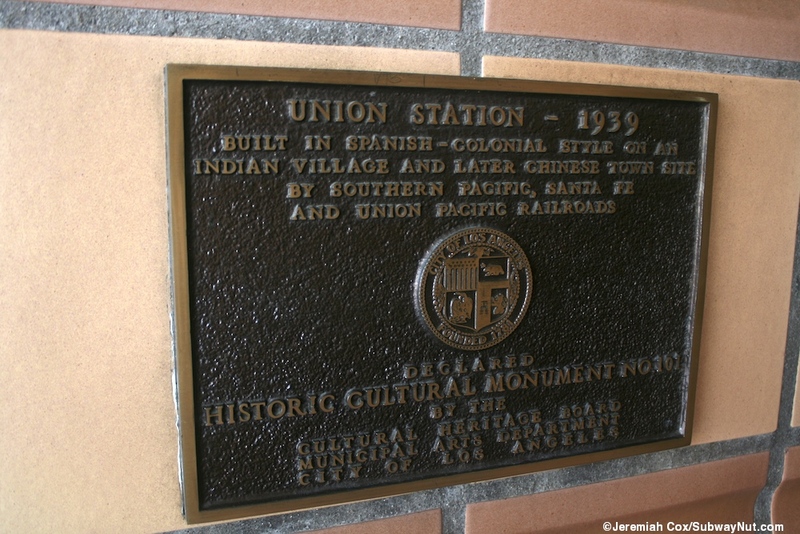 Los Angeles Union Station is considered one of the last grand downtown Union Stations to be built, opening in 1939. It's painted white and is of a combination Spanish Colonial, Mission Revival and Art Deco style that completely fits its southwest setting. 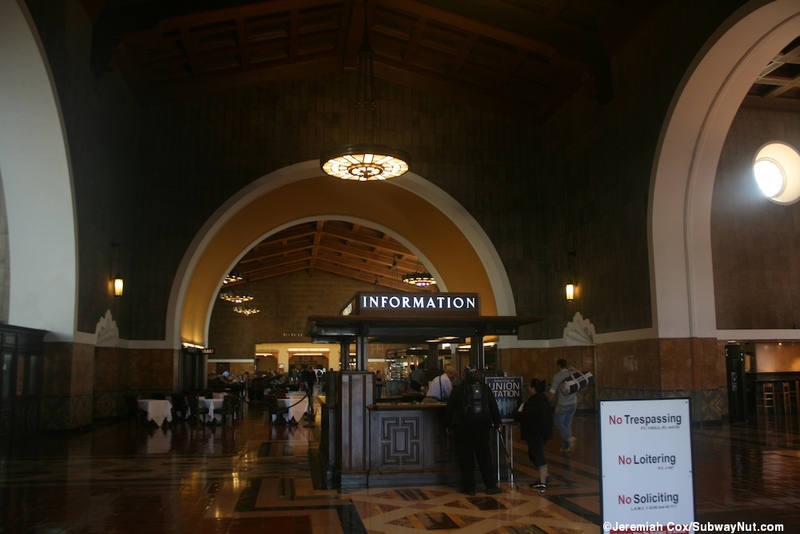 Today the depot is a bustling place, although many areas of the station such as the original Main Ticketing Concourse are no longer open to the general public, used exclusively for weddings, film shoots and other special events. Sleeping car passengers like to complain about boarding at the station since it lacks a Metropolitan Lounge, although Sleeping Car passengers on the Coast Starlight are allowed to wait (and receive coffee and tea) in the TRAX restaurant. 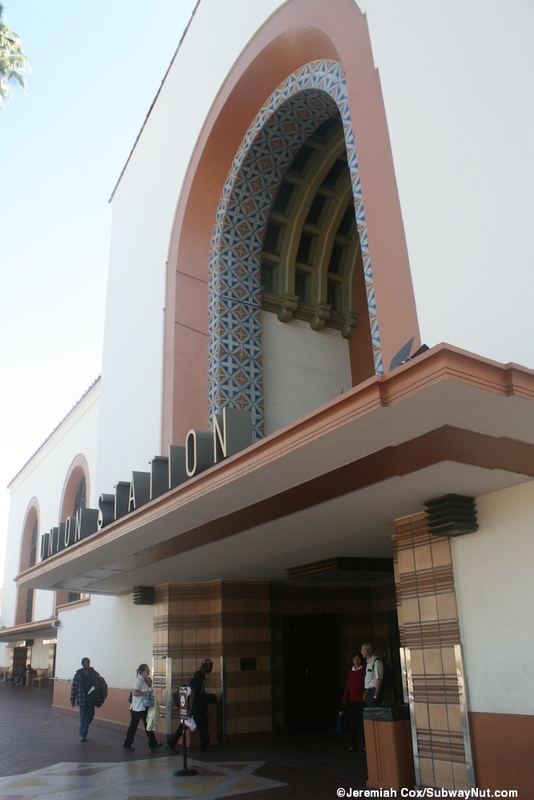 Entering the station, from the main passenger entrance at the end of Los Angeles Avenue just beyond Alameda Street, passengers first notice the white clock tower. 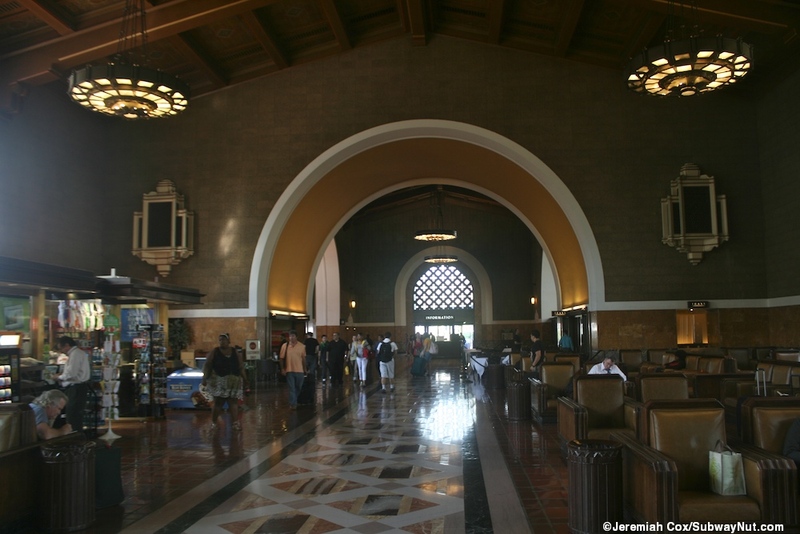 Entering is an entrance area with the closed ticket office off to the north (The best map of the station I can find, from Metrolink) and than the main waiting area with tall ceilings and large comfortable chairs with armrests you sink into. Walking through the waiting area passengers reach the central ticketing concourse where there are Gates E and F used to line-up and board Amtrak trains (although the platforms are not at all secure and passengers can skip the line-up process). 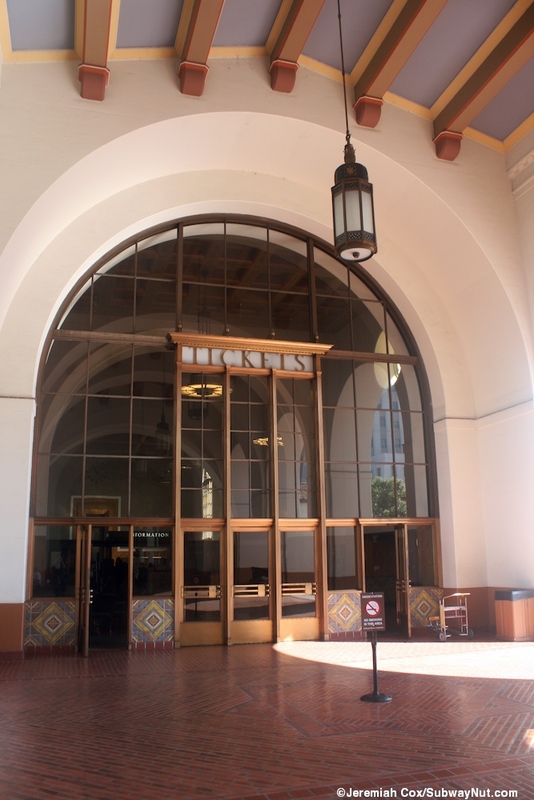 For the Long Distance Train departures of the Coast Starlight, Sunset Limited/Texas Eagle and Southwest Chief desks are rolled out into the middle of the concourse where Coach Passengers get there seat assignments in advance from station agents. 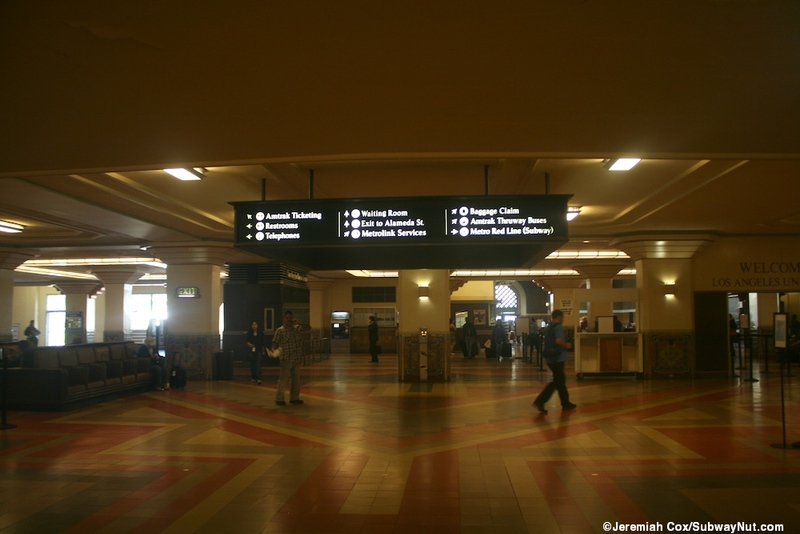 In the center there are separate LED departure boards for Amtrak and Metrolink listing track numbers. 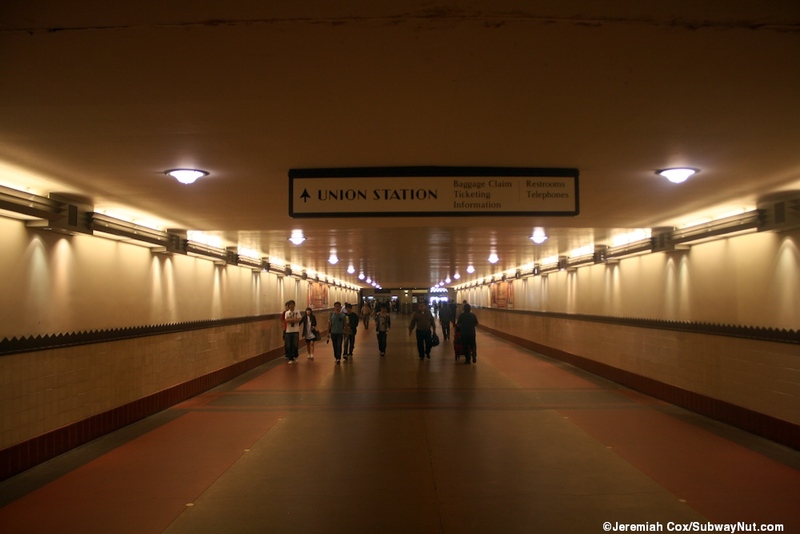 One of the entrances to the Red Line is from here. There are a few take-out restaurants and newsstands on the sides of this area. 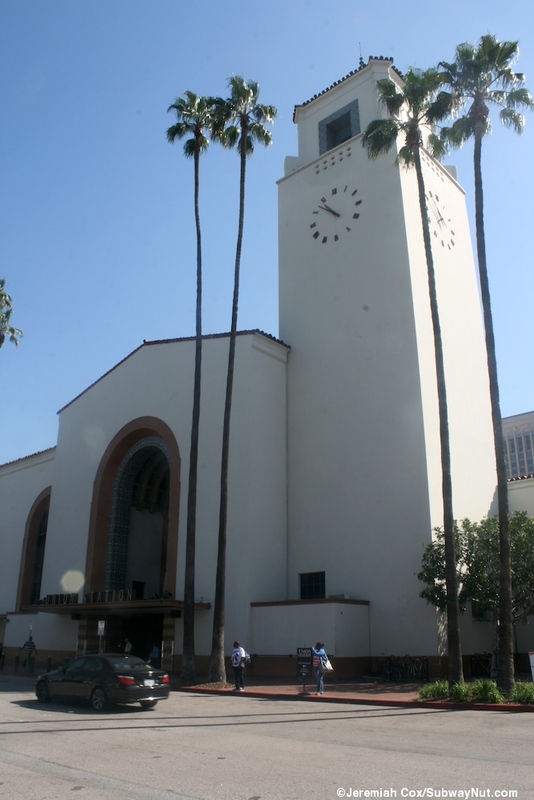 The Amtrak ticket office (with baggage check) is on the south side of this area and the Amtrak Baggage Claim is along the Northside, with the baggage office. There are a few Amtrak Quik-Trak Machines here but Amtrak tickets can also be printed (and purchased for Surfliner travel) from Metrolink TVMs scattered throughout the complex. Thruway Buses, connecting to all San Joaquin departures, board at the bus bays just beyond here. Trains are reached via a single fairly wide underpass. 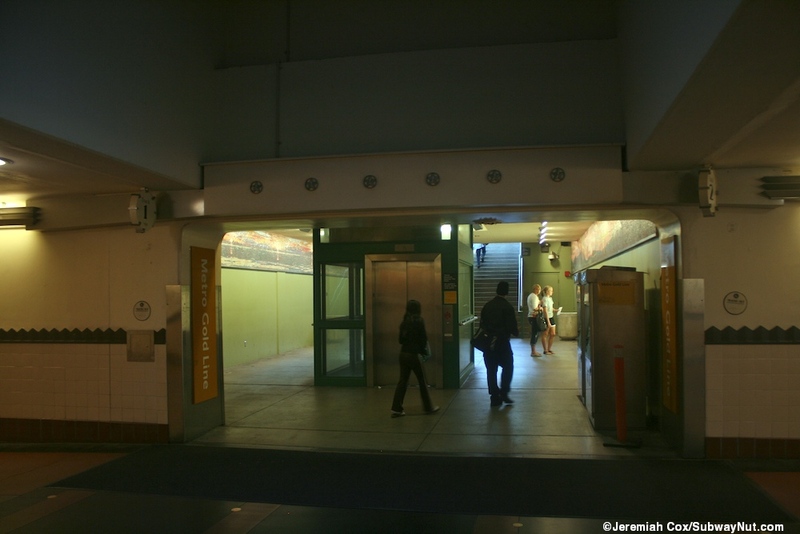 In this tunnel first is the entrance to the Metro Gold Line's platform (tracks 1 and 2). 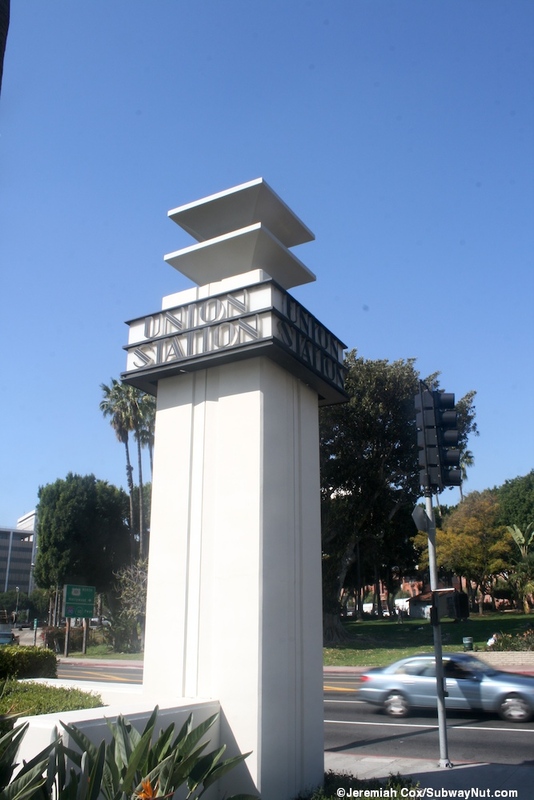 This is followed by two ramps up (radiating from each direction) to five platforms for ten mainline tracks, at the other end of this underpass the tunnel reaches the Gateway Transit Center where the L.A. Metro is headquartered. 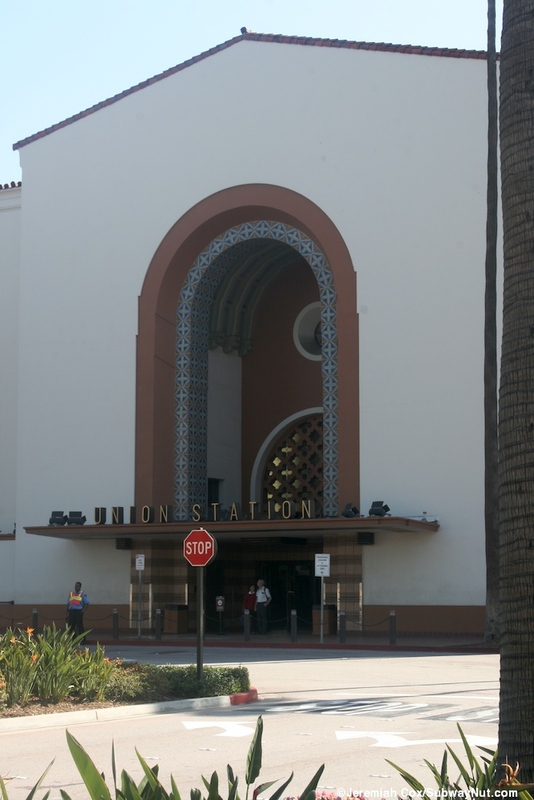 Here is where the main Metrolink and L.A. Metro customer service windows are and the other entrance to the Red (and Purple) Lines Subway Station. Beyond this is a bus loop for local bus connections at the Patsaouras Transit Plaza including the FlyAway bus to LAX Airport. 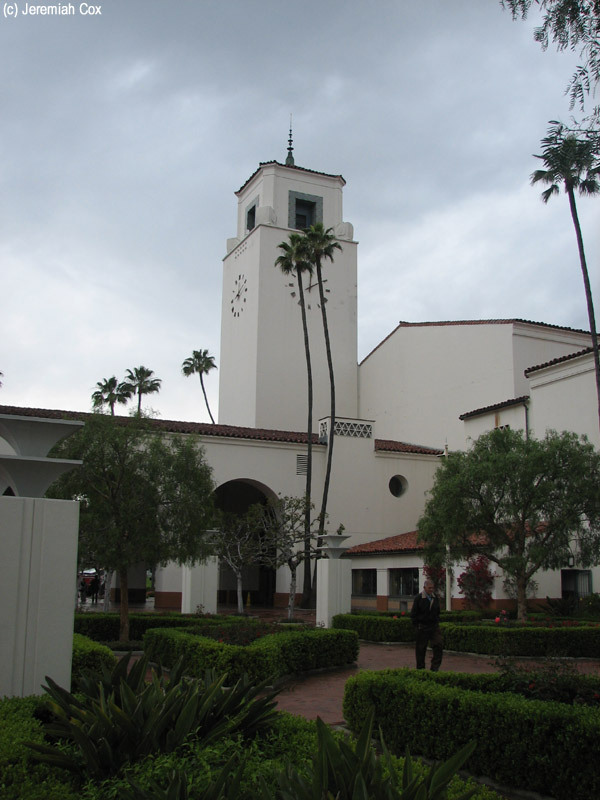 The station is slated to become a major hub for the California High Speed Rail System, with new tracks and platforms to be built above the existing ones. 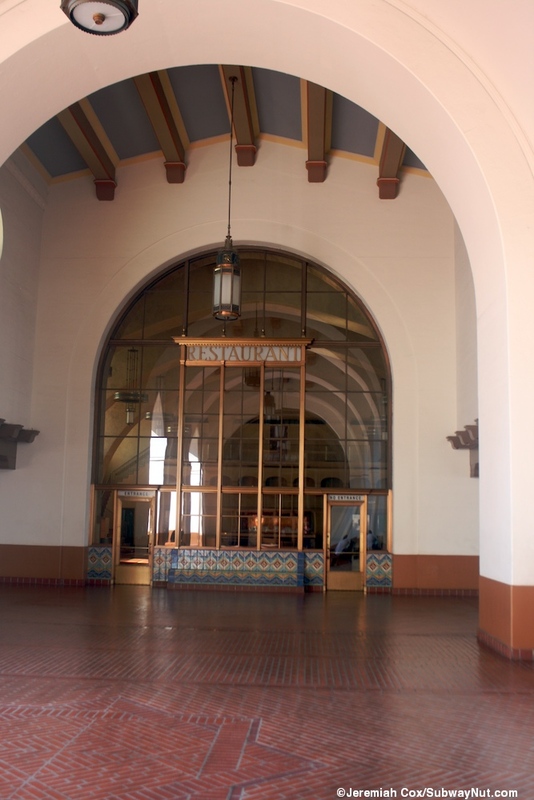 On September 23, 2013 (a soft-launch, a formal dedication occured on December 19, 2013) Amtrak finally opened a first class lounge for Sleeping Car, Pacific Business Class, and Select+/Select Executive Passengers. 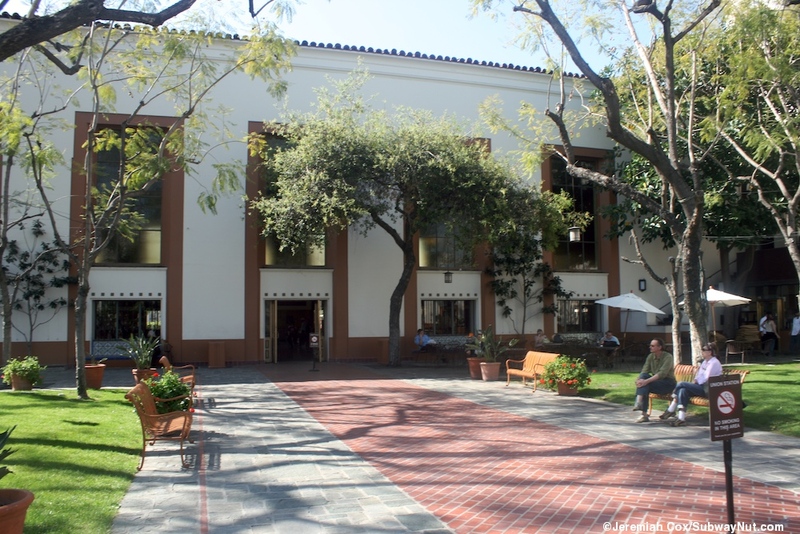 The lounge is located on the second floor (formerly used as office space) of the station. 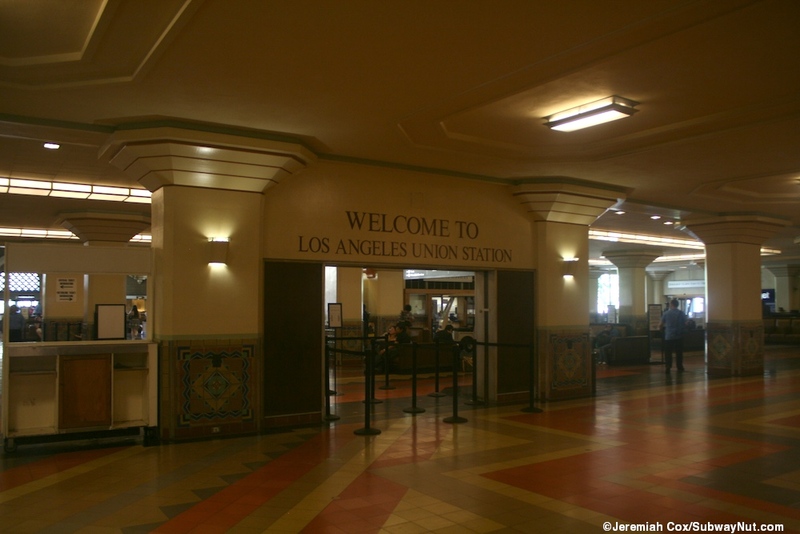 It is accessed via a bank of two elevators beyond the rental car counters marked by a simple, white portable sign, or up an unmarked staircase. It is extremely hard to find. There are a few portable signs with the Metropolitan Lounge logo on them but the lounge hasn't been included in the station's permanent signage. 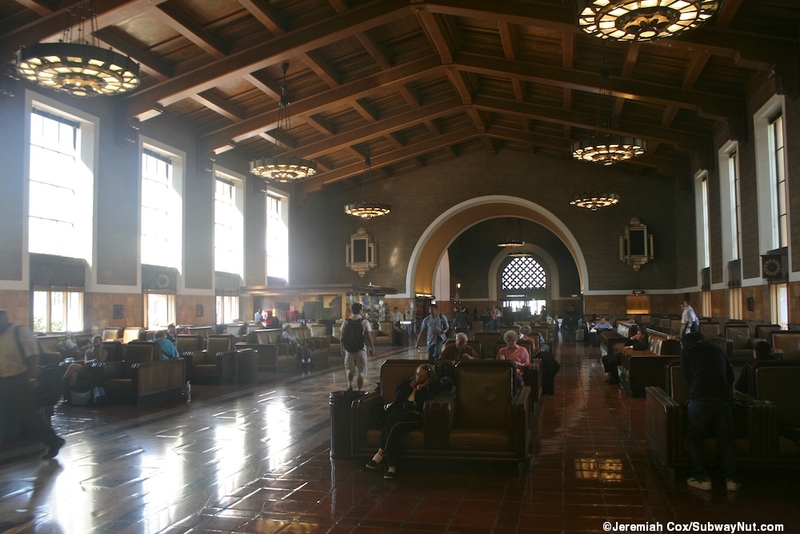 Once passengers find the lounge its an extremely pleasant place to wait for a train. There is a desk for an Amtrak agent (who as of January 2014 is still waiting for a ticket printer), a locked with a large wardrobe for free left luggage (with Red Cap Claim Checks given out). Entering the main seating area is a mix of brown leather chairs along some of the walls with little attached writing desks and movable chairs around tables for table seating. A buffet counter has a coffee machine and filtered water machine. Sodas are small cans in a fridge beneath. The afternoon food selection was a number of oversized cookies, not the usual pretzels and gold fish of the other lounges. There is unfortunately a television. 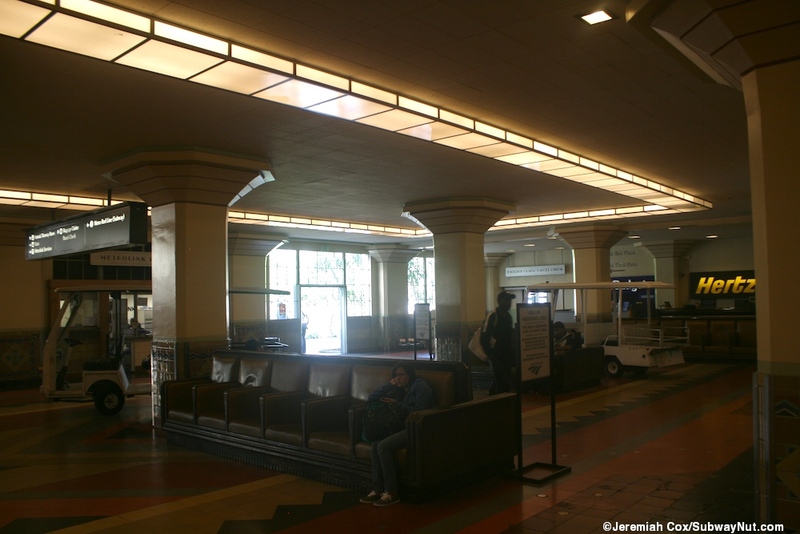 In the back of the lounge are restrooms and a conference room with lights that automatically turn on and the Los Angeles Metropolitan Lounge etched in the glass. Artwork in the lounge is extensive and neat with some display cases and original paintings of Amtrak scenes by Amtrak Assistant Superintendent of Road Operations Eric Smith. For coach passengers on long-distance trains with lounge access no advance seat assignment services are currently provided. These passengers must go down into the main station and line up with everyone else. Seat assignments are no longer given out my agents at desks beyond the ticket counters but now directly from the Amtrak information windows (with agents being completely unreasonable about giving passengers traveling alone their seat preferences). 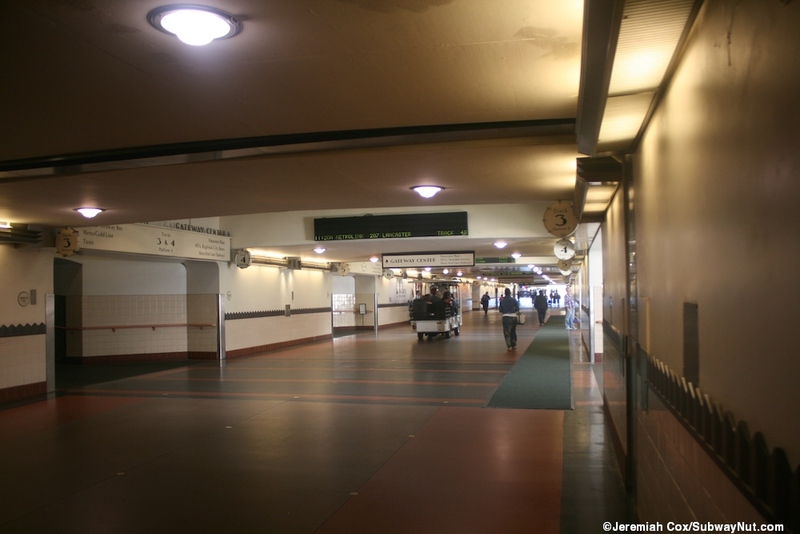 The lounge is located at track level and trains can be boarded directly from it although only via Red Cap Carts, not by walking. This is because the red caps are required to cross the Gold Line Tracks at a grade crossing south of the gold line platform before reaching each of the train platforms via an access road beyond the tracks bumper blocks. This grade-crossing is unusual with a red light going on before the bells and whistles to get the red caps to stop sooner since the carts are slower than vehicles. General Seating Roped Off: Since Union Station opened the general seating area was pretty much free comfy seating for nearly everyone (including the homeless). 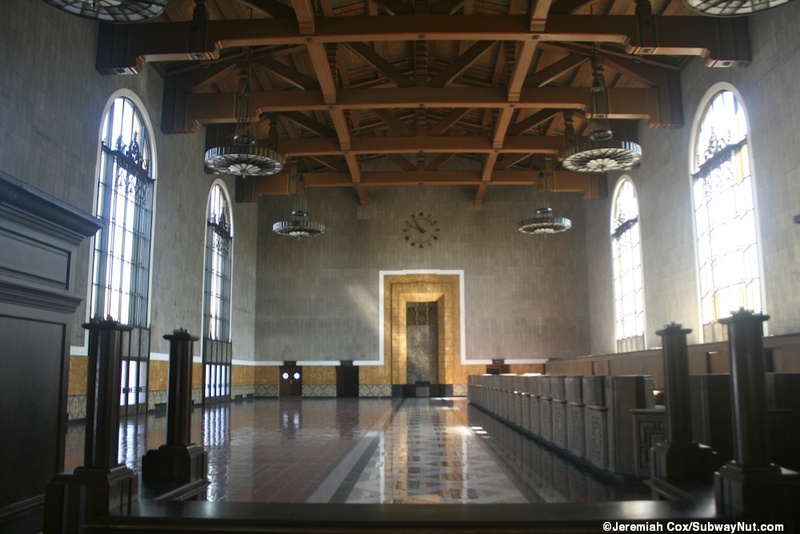 On December 9, 2013 L.A. Metro (who has owned the station since 2011) decided to change that roping off all of the historic chairs for seating and creating distinct seating areas. One side is now for Amtrak Ticketed Passengers only traveling within a three-hour period and or connecting to a later train. 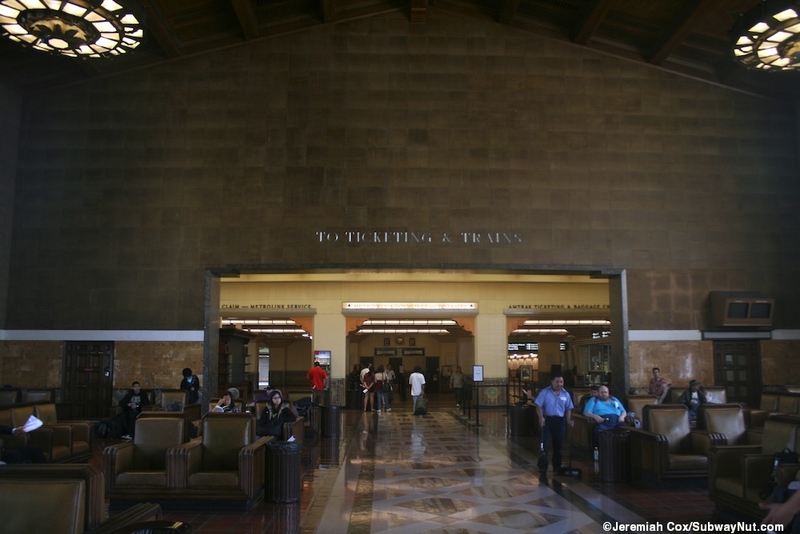 The other is for Metrolink Ticketed Passengers only traveling within a two-hour period. Additional seating has been completely closed with black ropes and security guards are actively enforcing the new policy (as of January 2014).